"didn't have a mushroom cloud"!!! 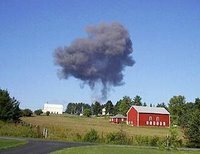 This blog is dedicated in finding out if the smoke plume in Val McClatchey's infamous "End of Serenity" photo is from an explosion originating from a different location than the alleged crash spot of Flight 93 in Shanksville, Pa which would prove the official story is a fraud, or if her photo itself is a fraud. More Smoking Guns, or Total Fraud? How was there even an explosion at Shanksville?